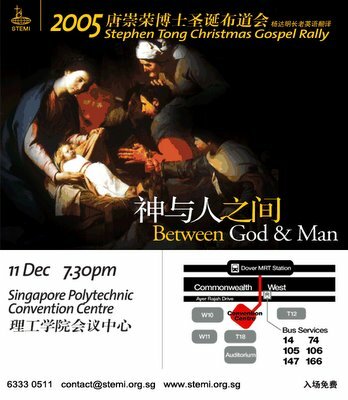 This is the detail of Dr.Rev.Stephen Tong's yearly Christmas gospel rally which gives a clear presentation of the meaning of Christian faith. Has there ever been a moment where the unbounded realm of eternity intersected with time-bounded history of humanity? Do come and invite your friends to learn of the gift of eternal life which has come at infinite cost to God, Jesus Christ His only Son, the greatest Treasure wrapped in human frailty. He is the Eternal King, yet He is bone of our bones, the flesh of our flesh, the Desire of all nations, the sole Hope of humanity. Feel free to email me if you need further information. In the last session we discuss about the relationship between law and freedom. This is a very unique concept. Why is the law spoken as the law that gives freedom rather than the law that constrains? Indeed the law does both. When God gives us the law, it is to let us have no part in sin so that we can have a part in true freedom. The concept of freedom in a sinner's mindset is totally opposite. To a sinner, freedom is the freedom to sin. This kind of freedom is a false freedom (不自由的自由). But the constraint of the law is where the true freedom is (自由的不自由). There is also a relationship between law and mercy. The summary of the law is love. Again, to a sinner trapped in sin, the law is to him only justice which gives the due verdict for his sin. The law indeed shows us that God is just and holy. Therefore it is meant to awaken us to our sin. But like the Jews who was entrusted the law, instead of being awakened they became arrogant because they think they are superior to others, we often sin the same way in our pursuit of the Truth. If we look down on others because we feel we have a greater pursuing heart than others, we have fallen lower than everyone else we look down upon. God hates self-righteousness. Jesus said that unless our righteousness surpasses that of the Pharisees, we cannot enter the Kingdom of heaven. In this, we can see an important principle that self-righteousness will kill all the righteousness we have. Our arrogance over our good works negates all the good works we have done because we have failed to acknowledge the Source of all good. A sinner that prays, “Lord, have mercy on me, as sinner!” is more justified than someone who boasts before God of the little he has done. God gives us the law not to make us self-righteous and despise others, and being entrusted with the law does not mean we have achieved greater knowledge. It is meant for us to know our sin. This is very scary because superficially they are the chosen people, but in reality God will reject them. There is a relationship between law and mercy. The Pharisees have a little bit of righteousness and look down on others. Jesus is completely pure and holy but His attitude towards sinners is completely different from the Pharisees. When the sick asked if He willed to heal them they would be healed, Jesus said, “I am willing. Be healed.” And people were cleansed. His justice did not prevent His mercy. So He lived as a perfect example for us as One who fulfilled the demand of the law perfectly on one hand, and extended mercy to all the lawbreakers. This is true spirituality. Our common disease is that when we know a little bit of the law, we use it to judge others rather than subject ourselves to fulfill its demand on us. If God treats us the same manner we treat others, He is perfectly just to do so, but He has mercy on us. But is it possible to know the demand of justice and yet forgive the lawbreakers? It is possible because we have been given a Living Example, Christ Himself. The Cross is where God's justice and mercy meets. It is the culmination of God's wisdom. It is the platform where God's power is displayed through human frailty. It is where righteousness and love come together. It is intersection point between eternal salvation and temporal sufferings. Verse 12 says to speak and act as those who will be judged by the law of liberty, so that we can retain our freedom. This is right theoretically but we cannot fulfill it in practice. So the law of freedom, because we break and have not power to fulfill it, becomes one that curses and constrains us. We lose our freedom because we go against the law where freedom is. How then do we relate God's love and God's law? Firstly, God's motivation in giving us the law is His love. Secondly, the purpose and the summary of the law is love, i.e. loving God with all our heart, soul, mind and strength, and loving others as ourselves. It is very difficult to both fulfill the demand of the law and to be merciful to others. There is continual temptation to become a Pharisee when a person pursues more in spirituality. Therefore, we need to call on God every moment so that on one hand we keep seeking the Truth, on the other hand we remain humble. A perfect person never considers himself perfect. The more perfect a person is, the more he feels imperfect. Verse 13 says that if we show mercy, God will judge us with mercy. We all understand that we can give mercy because God first has mercy on us. But in the prayer Jesus taught His disciples, He seemed to reverse the order. He said to pray, “Forgive us AS we forgive others.” Order is important. Confucius once said that knowing the right order means we are very close to the Truth. What then is the right order in this case and why did Jesus taught a reverse order in forgiveness, i.e. we forgive first and God will follow our manner? It is true that the right order is God's forgiveness first comes to us before we can forgive others. But in this prayer, Christ is teaching us responsibility towards grace. Those who have received grace ought to respond properly to grace. If we only know grace and not responsibility, we cannot know the Truth wholly. Grace comes before all our actions and is the foundation of our power to obey, and it comes parallel with responsibility. Dietriech Bonhoeffer's most famous phrase on the cost of discipleship is “The grace of God is free, but it is not cheap.” He objected to the concept of grace which caters to laziness, which wastes, sells and betrays it. It is free to us, but it cost God everything. When grace comes to us, responsibility comes with it. Based on status, God loves us first. God has forgiven and saved us first. After salvation, we know how to love and how to be merciful. After our new life, our lifestyle turns around. Now if we do not show mercy to others, God will not show mercy to us. Since we have been saved, if we do not have a new lifestyle we are not worthy of grace. Dare we face God's judgment? Don't we need mercy? Then we ought to be merciful to others. The law is here but we do not need to be afraid because mercy triumphs over judgment.